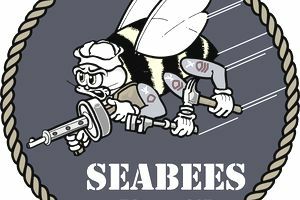 The United States Navy Construction Battalion, also known as the "Seabees," have a motto that is representative of their story since the days of World War II. The Navy Construction Battalion, whose abbreviation "CB" became its nickname, was established in 1941 after the attack on Pearl Harbor. In its early years, Seabees were under the Navy's civil engineer corps and were recruited from construction trades. Primarily utilized as builders, Seabees played a major role in World War II, and later in the Korean War, where they landed at Inchon with assault troops. Seabees built causeways in Korea just hours after their initial landing. Between 1949 and 1953, Navy CBs were divided into two units: amphibious and mobile battalions. The Navy calls their enlisted jobs ratings. Similar ratings are placed in various communities. After World War II, the need for such trained forces was considered a priority by the Department of Defense, and between 1949 and 1953, Naval Construction Battalions were organized into two types of units: Amphibious Construction Battalions (PHIBCBs) and Naval Mobile Construction Battalions (NMCBs). There are also Naval Underwater Construction Teams that are also trained divers who secure piers and perform welding underwater when required. The work and responsibilities of Seabees cover a wide range. That may include work like grading an airstrip, conducting soil tests for an amphibious landing zone, or building a new barracks facility. There are several ratings under the Construction Battalion community, and in addition to being crucially important to the day-to-day operations of the Navy, these jobs are good training for post-military construction careers. Seabees include builders, construction electricians, construction mechanics, engineering aid, equipment operators, steelworkers and utility workers. Builders (BU): Builders make up the largest segment of the Naval Construction Force. They work as carpenters, plasterers, roofers, concrete finishers, masons, painters, bricklayers, and cabinet makers. This can range from building shelters, wharves, bridges and other massive timber structures. Construction Electrician (CE): Construction electricians build, maintain, and operate power production facilities and electrical distribution systems for Naval installations. Their duties include such work as installing, maintaining and repairing telephone systems and high and low voltage electrical power distribution networks, splicing and laying electrical cables and other related electrical work. Construction Mechanics (CM): Construction mechanics repair and maintain heavy construction and automotive equipment including, buses, dump trucks, bulldozers, rollers, cranes, backhoes, pile drivers, and tactical vehicles. CMs also prepare detailed maintenance records and cost control data and acquire parts. Engineering Aide (EA): Engineering Aides assist construction engineers in developing final construction plans. They conduct land surveys; prepare maps, sketches, drawings, and blueprints; estimate costs; perform quality assurance tests on common construction materials such as soils, concrete, and asphalt; and perform other engineering technician functions. Equipment Operator (EO): Equipment operators drive heavy vehicles and construction equipment including trucks, bulldozers, backhoes, graders, forklifts, cranes and asphalt equipment. Steel Worker (SW): Steelworkers rig and operate special equipment used to build metal structures. They lay out and fabricate structural steel and sheet metal and work with concrete reinforcing steel bars. They perform welding and cutting operations, read blueprints and use special tools. Utility Worker (UT): Utility workers may work on plumbing and heating jobs, distribution systems and fuel storage, and other basic utility work. Their duties also include working on water treatment and distribution systems, air conditioning, and refrigeration equipment, and sewage collecting and disposal facilities at Navy shore installations around the world. What Does a Navy Construction Mechanic Actually Do? What does a Navy Equipment Operator Do? What Does a Navy Culinary Specialist (CS) Do?